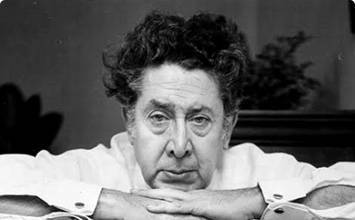 The below artworks are the most important by David Alfaro Siqueiros - that both overview the major creative periods, and highlight the greatest achievements by the artist. Artwork description & Analysis: On the ceiling over the staircase in the small courtyard of the National Preparatory School, Siqueiros depicted a monumental winged female surrounded by representations of the four elements. Reflecting Siqueiros's study in Europe, the work combines elements of Byzantine icons in the sandy-colored background, with a sculpturesque figure inspired by Renaissance painter Masaccio. Around this figure are symbolic representations of fire (vivid red abstract flames), wind (horizontal spirals that balance the vertical of fire), water (the seashells) and earth ("two giant bones of a tropical fruit"). In relying on these abstract notations of the elements, Siqueiros creates a timeless depiction of Mother Nature and her realm. Artwork description & Analysis: The original commission for this outdoor mural was intended to show the abundance of tropical America, however Siqueiros created a highly politicized critique of American imperialism. A crucified American Indian appears in the very center of the work. A menacing eagle, a clear symbol for the United States, is perched atop the cross. Behind the Indian, a Mayan temple in the process of being engulfed by tropical plants, forever to be forgotten. On the top right, watching the tragic spectacle, a Mexican and a Peruvian, are shown armed and ready to defend their land and culture from the apparently inevitable victory of American capitalism culture over their own heritage. Perhaps unsurprisingly, the mural was hostilely received and whitewashed within two years. Artwork description & Analysis: This large fresco, located in a relatively small library, spans two facing walls and the ceiling to create a single vault-like shape that dwarfs the viewer with its impressive, larger-than-life figures. The south wall (shown) depicts the Chilean indigenous peoples in their struggle for freedom and independence from the European Conquistadores; the north wall echoes this with representations of indigenous Mexicans. In the center appear historic fighters, most visibly the 16th-century Mapuche warrior, Galvarino, who raises his maimed hands. Attached to his body is the head of 19th-century Chilean philosopher Franciso Bilbao. Combined, this joint figure symbolizes the need for both physical and mental force in combat. Around them are gathered other figures of resistance and independence, including Lautaro, Luis Emilio Recabarren, Bernardo O'Higgins and President José Manuel Balmaceda. Siqueiros also depicts the Old Chilean flag, the new flag, and the current one. The energy and pathos of the scene is shown through the tense muscles, Galvarino's battle cry, the extreme foreshortening and the merging quality of the figures and the background that appear as a nebulous ensemble of bodies and projectiles. 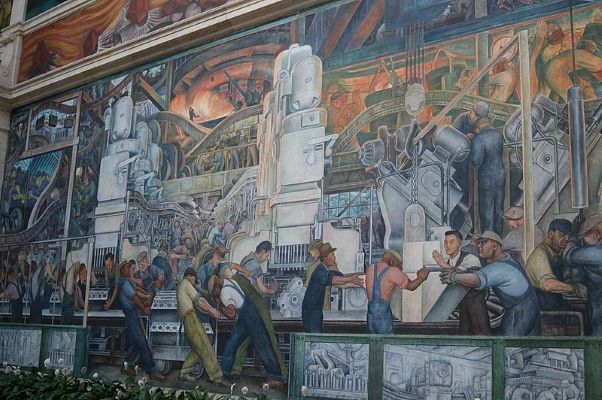 Artwork description & Analysis: Located on the second floor gallery of the Palace of Fine Arts, next to murals by Rivera and Orozco, this nearly 20' x 40' mural was painted to celebrate the victory over fascism at the end of WWII. This mural depicts a woman with exposed breasts, wearing a revolutionary Phrygian cap, raising her arms from the chains that had enslaved her. She looks to the skies with a pained expression, recalling the horrors of the war. In one hand she carries a torch with freedom's flame and in the other, a white flower. A third, heavily muscled arm emerges from her body to represent the triumph over fascism, whose personification lies foreshortened on the ground, a crumpled form painted in grisaille. This is the central panel of a triptych, along with panels commemorating the Victims of War and Victims of Fascism. Artwork description & Analysis: This monumental panel is part of a diptych Siqueiros painted on the second floor of the Palace of Fine Arts. This portion depicts the last Aztec Emperor, Cuauhtemoc, whose alleged remains had recently been discovered. This scene portrays the 16th-century hero being tortured by the Spaniards to make him confess the location of the Montezuma treasure. The stoic Cuautemoc lies supine as the flames begin to consume his legs. Crying desperately beside him appears Tetlepanquetzal, a Mexican king. Behind a wall of armored, anonymous Spanish soldiers appears La Malinche, a woman of noble blood who became a slave when she was gifted to the conquistador Cortes to become his translator. On the left, a personification of the Country, dressed in red, throws her arms up, and is imitated by a young maimed girl beside her. The faceless Spaniards watch impassively, Siqueiros has stripped them of their humanity, but a vicious dog in the center of the composition condenses the pathos of the mural. Artwork description & Analysis: Located in the vestibule of a hospital, this mural is painted on a paraboloid or egg-shaped surface so large and engulfing it can confound and overwhelm the viewer with visual input. Only when split into episodes or formal groups does the scene becomes intelligible: on the left, a dramatically foreshortened Prometheus brings the fire of civilization to man. To his left, a group of workers mourn the loss of a companion, killed by a machine. On his right, a group of women march forward triumphantly, carrying symbols of nourishment, life, freedom, poetry and love. On the other side of the wall, a group of workers and intellectuals similarly march united towards freedom. A rainbow and a five-point star crown the work. Vinylite and pyroxyline on plywood and fiberglass - Raza Hospital - Mexico City, Mexico. Artwork description & Analysis: This project, the largest mural in the world, comprises the interior and exterior of an entire building, as well as the walls surrounding it. Designed as a political and cultural center, the Polyforum Cultural Siqueiros includes several exhibition spaces, most notably the Forum Universal which houses the interior section of this mural. 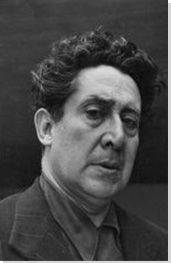 Standing on a rotating platform and listening to Siqueiros's narration, the viewer witnesses The March of Humanity unfold around him. An endless sea of people march from a past riddled with negative symbolism towards the triumph of Revolution. The ceiling depicts an archetypical man and woman: the Adam and Eve of a new society. The iconological program, ultimately, is about a march towards freedom, justice, and peace. Within this procession, Siqueiros included five portraits of men who had given Mexico a new, idiosyncratic art: Rivera, Orozco, Guadalupe Posada, Dr. Atl, and Leopoldo Mendez.